An uncompromising script and a solid performance from Leonardo Di Caprio help make THE BASKETBALL DIARIES a powerful and memorable film experience. 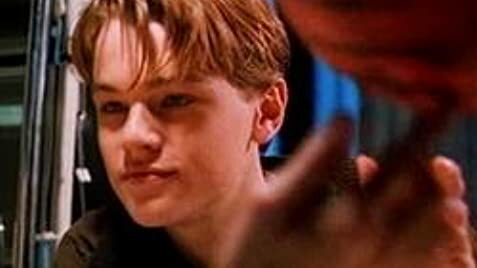 Leo plays Jim Carroll, a high school student with a love of basketball and a flare for writing whose life goes right down the toilet when he becomes a heroine addict. Yes, perhaps Leo gets hooked a little too quickly but everything that happens to him after he gets hooked is totally real. Along with CLEAN AND SOBER, this movie so clearly and honestly demonstrates where drug addiction can take you...how nothing else becomes important but how and where that next high is coming from. There is one harrowing scene after another here. We see Jim returning to his mother (Lorraine Bracco) after being kicked out of the house and we see Jim turn from begging child to threatening thug in a matter of seconds, a scene brilliantly performed by DiCaprio. We see Jim and his friends beat up an old lady for her purse and we even see Jim prostitute himself with a man in order to get money. It's a frightening and realistic spiral downward that Jim takes and he does make it back, but it is important to remember when watching this film that a lot don't. DiCaprio gets solid support from future star Mark Wahlberg, Bruno Kirby, Jr., Juliette Lewis, and Michael Imperioli. A harrowing film experience that will not be forgotten once the credits roll. Mark Wahlberg later took the role originally offered to Leonardo DiCaprio in Boogie Nights (1997), who turned it down so he could work on Titanic (1997) instead. Jim: Don't worry, Swifty, I won't rat you out. Jim: And in the next life, Father, I'm gonna have the paddle! Supposedly set in winter, yet deciduous trees with green leaves are visible. This film was passed uncut with an 18 rating in the UK in 2000. It was previously cut by 47 seconds by the distributor. The cuts were to the dream sequence where kids are shot in school, which was removed by the distributor in response to the Dunblane massacre.